What have I been doing for the last week and a half? 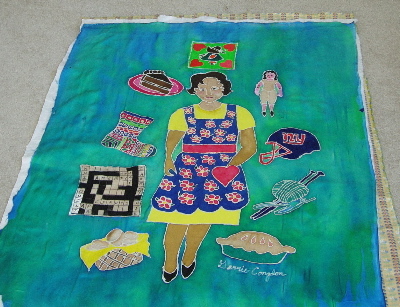 Remembering my mother for a quilt that I am entering in the I Remember Mama exhibit for the International Quilt Festivals in Houston and Chicago. Karey Bresenhan changed the requirements so that we can send jpegs. And after talking to Joy Lily, the silk artist who taught us Shibori dyeing, I thought I would try to do a whole cloth silk painting. Fools rush in where angels fear to tread and we know which one I am!! My mother was a pretty amazing woman. She died when she was about my age in an automobile accident. She knitted way before knitting was cool or maybe it was cool back then. 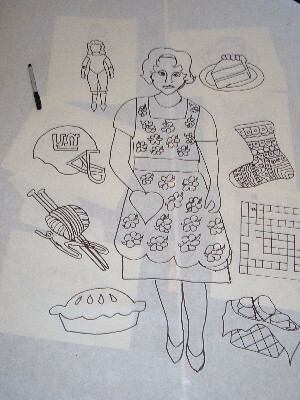 She quilted, made and dressed antique reproduction dolls and was the BEST pie and biscuit baker ever. Once when she was leaving our home after Lisa was born, Mark, who was two, said – “No more ackle pie, no more chokit cake.” She also was a huge sports fan and loved the NY Giants. She did at least one crossword puzzle every day. And when she was at home she always wore an apron and she always had the TV on! She did all this while raising 5 children (I was the oldest) and fulfilling the role of a farmer’s wife which meant grading eggs, canning maple syrup, gardening, canning, freezing food for the family, preparing huge meals for the harvesters. I could go on and on. Her name was Rachael Emmiline. 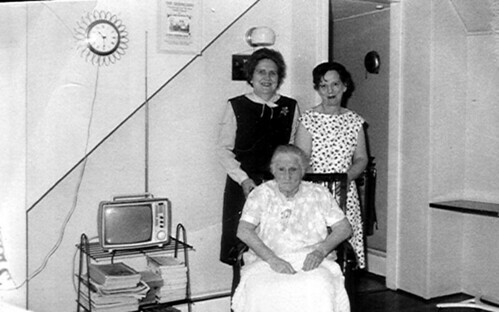 Here she is, in the printed dress, with my aunt Grace and Grandma Mary at the nursing home. I used this photo as my model to draw her. Here it is partially painted. Here it is sandwiched and ready to quilt. OK. No giggles. This was a big departure for me. I did it. I sent in a cd of the images and it doesn’t really matter whether I get accepted or not. It was a wonderful journey remembering mama. Today was the beginning of the green season in the Episcopal church – also known as the ordinary season. The silk banner I made back in March for the Quilt Art list challenge made it’s debut. 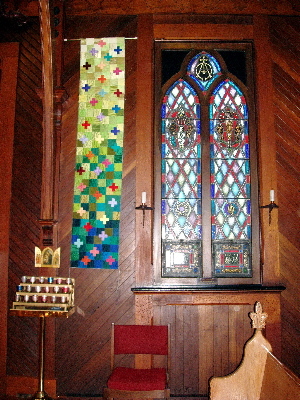 It looks stunning next to the stained glass window. One young man told me he could not take his eyes of it during the service and Fr. Matt wants a whole set of vestments with the same design. I’ll have to think about that for awhile!! Anyway, here is how it looked. It seems to be hanging crooked, but it didn’t look that way at church. I’ll have to go back in and check!! 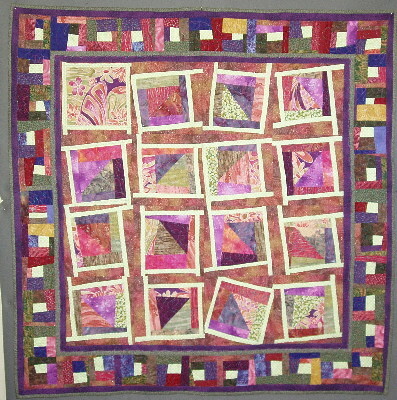 When Debra came to visit my art quilt group last Tuesday, she brought this wonderful quilt for me. She wants to me to teach her to screen print in exchange. I think it is a super, duper deal on my part. Debra says that she got out of her box and bought these fabrics in these colors and quilted it and has never loved it. 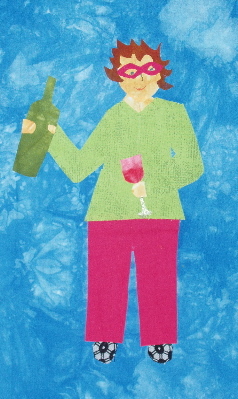 She and I were at Art Quilt Tahoe together so she knows I love these colors – well, anything with lime green. The lighter fabric is a light lime green – it doesn’t show up well in this photo. Thanks, dar! I have had two very busy days. On Monday, I worked at the SDA office getting work done for the conference coming up in Kansas City next week. I have to go in tomorrow and finish up. Today was Pointless Sister’s day. Debra, who is on the artful quilter’s blog ring, came for a visit. I was there with my camera and NO battery. Someone else took photos and will e-mail them to me and I will post them later this week. She brought the eucalyptus piece. 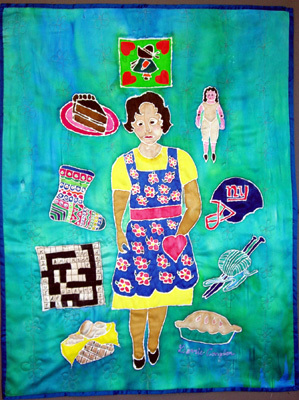 It is beautiful and her quilting is fantastic. We all loved having her visit and want her to become a member of our group. 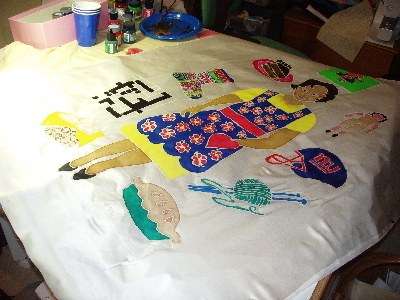 She also brought her painted fabric and it is even petter in person. After show and tell and lunch, I showed several members how to make art2mail. They did some fabulous pieces, but again, no camera, so you will have to wait for Sandy to send me the pics. Here, however, are some to see. You may recognize the beauty on the left. Karoda made it and posted it on her blog. I told her I thought it should be mine and voila! it showed up in my mail box. Was fun to be on the other end of art2mail!! Robot Man is for my adorable 3 year old grandson who loves robots. The top postcard is for Mia, my beautiful granddaughter. When I visited them last month, I said I would make and send them post cards and she requested a cat! The bottom piece will probably go to our neighbors who had us over for dinner last week. It is made with silk stamped with gold metallic paint. This is a self portrait that I did in a class with Sue Benner. We had them posted on our design wall. One day Freddie Moran came in to check out our work. If you’ve ever met Freddie, you know that she wears very large red eye glasses. She looked at my self-portrait and whipped around and scanned the room and her eyes caught mine and she gave me a big grin. 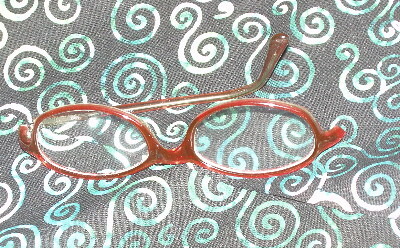 Well, yesterday, my red glasses broke – not a lost screw – they broke – boo hoo! I went to the Kaiser optometry place where I got the prescription filled. If I wait until June 6th, I can get a new eye exam and credit towards new glasses. In the meantime, I was going to try to super glue them or duct tape them, but I lost the broken part. So I guess I have to live with my bronze wire rims until then.